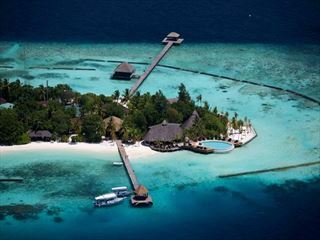 Olhuveli Beach & Spa Resort sits on its own private island – an exclusive slice of the Maldives, perfect for an unforgettable holiday. 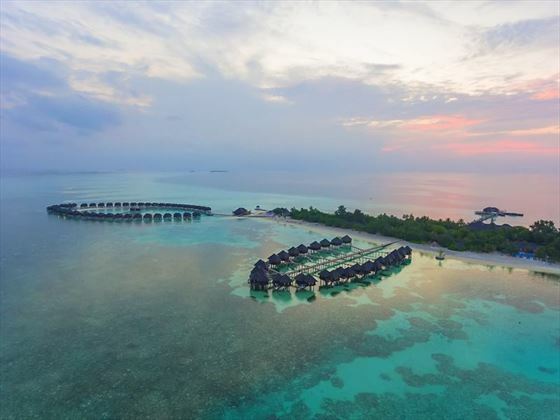 The resort boasts the classic beauty of the Maldives with traditionally-styled villas sitting over a crystal clear lagoon with a ring of icing sugar white beach beyond. 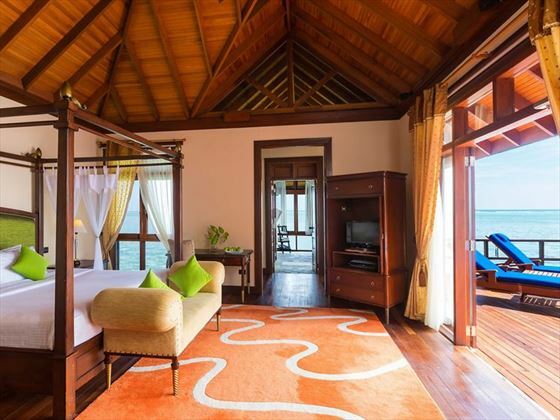 The accommodation has been thoughtfully designed to ensure you enjoy high levels of service and comfort – you can choose from simple but stylish beachside rooms or sample the quintessential Maldives experience with an over-water villa. 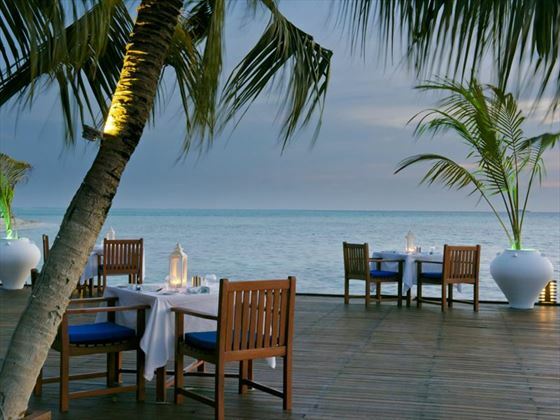 The resort boasts fantastic range of restaurants including an outdoor seafood grill and a fine dining option. There’s also an impressive selection of watersports on offering including everything from snorkelling to wake board – and there’s even a PADI dive centre if you’d like to really explore the underwater world. 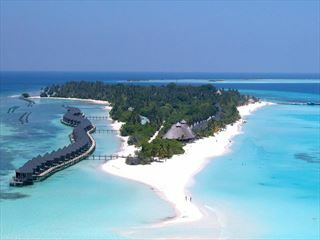 The resort sits on Olhuveli island in the South Male Atoll, found directly to the south of Male and the main airport. Enjoying a secluded position on this private island, you can look forward to complete privacy and relaxation. 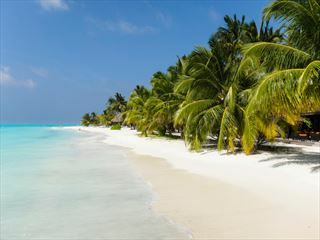 Olhuveli Beach & Spa Resort operates +1 hour ahead of Male for daylight saving time, your onwards speedboat to Male Airport will reflect Male time. 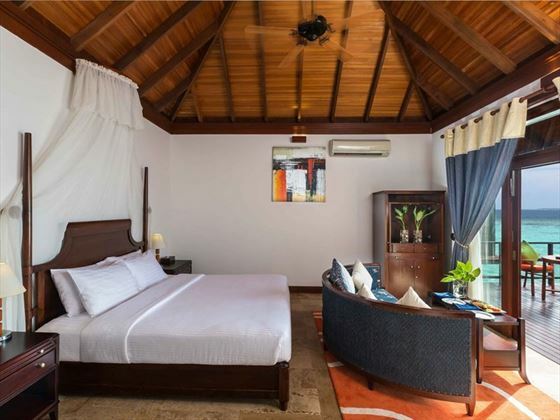 Grand Beach Villa – with an outdoor bathroom, multiple day beds and spacious interiors. 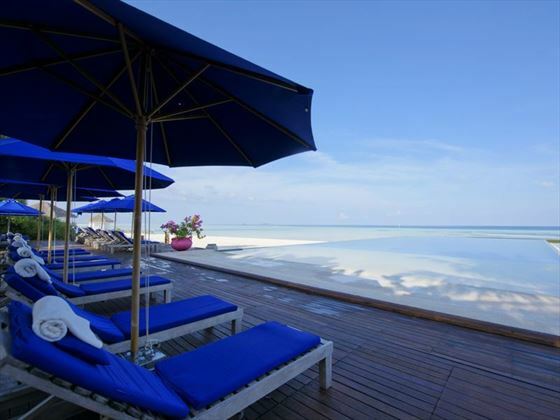 Grand Beach Villa with Pool – same facilities as the Grand Beach Villa with a private pool overlooking the ocean. 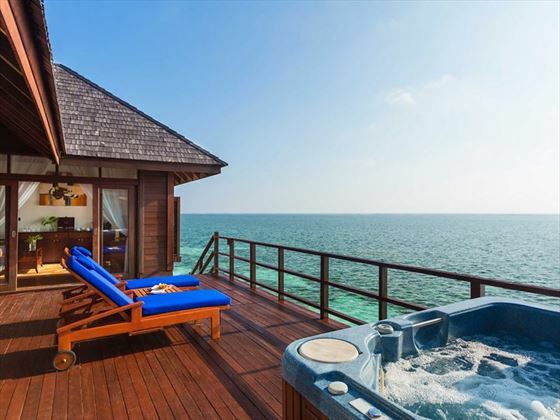 Sunset Jacuzzi Water Villa – same facilities as the Jacuzzi Water Villa with unparalleled sunset views. 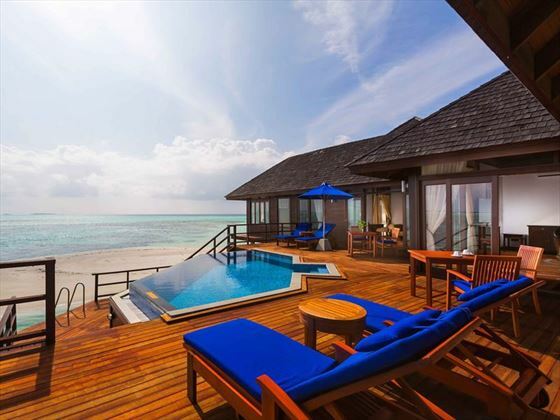 Presidential Water Suite – situated at the far end of the jetty offering complete privacy, two en-suite bedrooms, private sundeck, an open plan living and dining areas and a kitchenette. Breakfast - (buffet) served at the Main Restaurant (Sunset Restaurant) 0730 - 1000hrs. 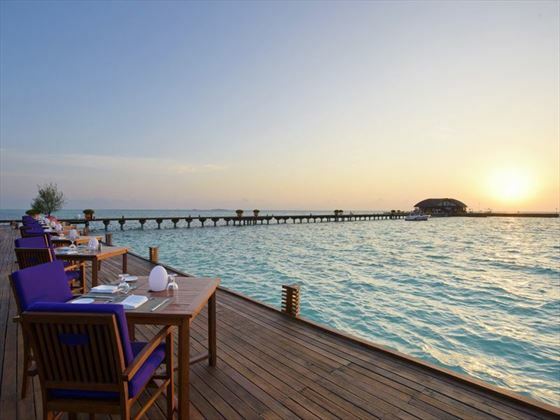 Guests staying at Jacuzzi Water Villas, Honeymoon Water Villas, Sunset Water Villas & Presidential Suites may also dine at Four Spices restaurant. Afternoon tea with snacks and sandwiches at Lagoon Bar (Between 16:00- 18:00hrs). Unlimited drinks served by the glass - Soft drinks (Coke/ Diet Coke/Fanta/Sprite/Ginger Ale/Tonic Water/Bitter Lemon/Soda Water/Iced Tea), Fruit Juices (canned & packaged), House Wine or Draught Beer. 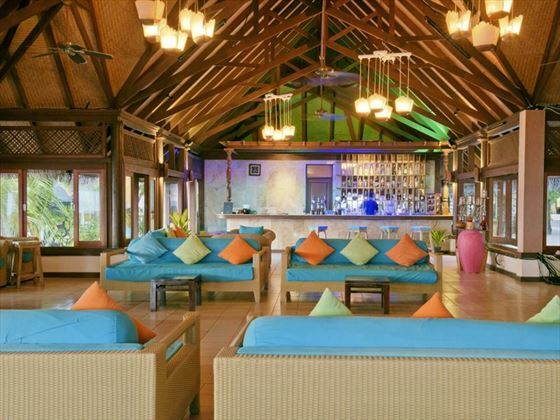 A la carte restaurants (namely Lagoon Restaurant (except where mentioned), Four Spices, The Plankton Grill and Island Pizza) room service, spa, watersports and diving DO NOT form part of the All Inclusive plan and will be charged at the resort rate. Afternoon tea with snacks and sandwiches at Lagoon Bar (Between 15:00- 18:00hrs). 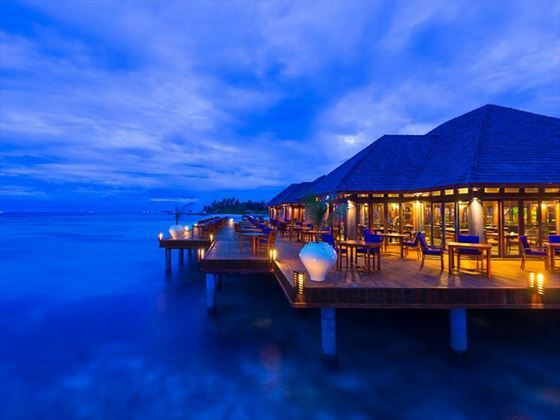 Dinner:Buffett dinner at Sunset Restaurant (1900 - 2130hrs), 5 course set menu at Four Spices - advanced booking required (1900 - 2230hrs), 5 course set menu at Lagoon Restaurant - advanced booking required (1900 - 2230hrs), 5 course candle lit dinner at Plankton Grill - once per stay, advanced booking required, specially designed In Villa dining menu. Diving - Guests can enjoy up to 6 regular dives per person per stay (quantity dependant of length of stay) as an alternative to spa treatments (guest must have a valid diving license and medical records) OR USD$100 Spa crdit per adult per day. 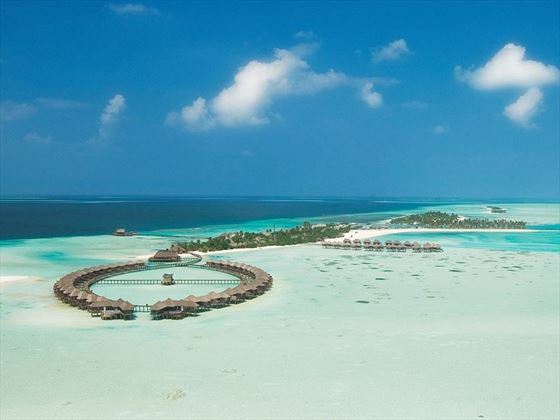 Honeymoon offer valid up to 6 months after wedding date and when staying for a minimum of 5 consecutive nights. Sorry, there are currently no prices available for your selected options. Please change your options or call us on 01342 310 589 for a quotation. 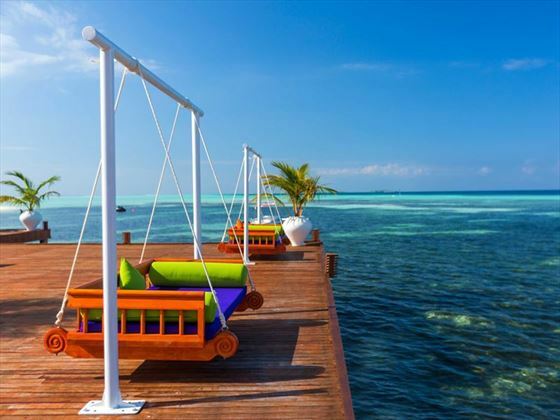 Located in the North Male Atoll, a one-hour speedboat journey from Male airport or a 20-minute seaplane journey (supplement payable). Surrounded by 1.5 kilometres of beautiful white sand beach and a magnificent lagoon offering excellent snorkelling opportunities.